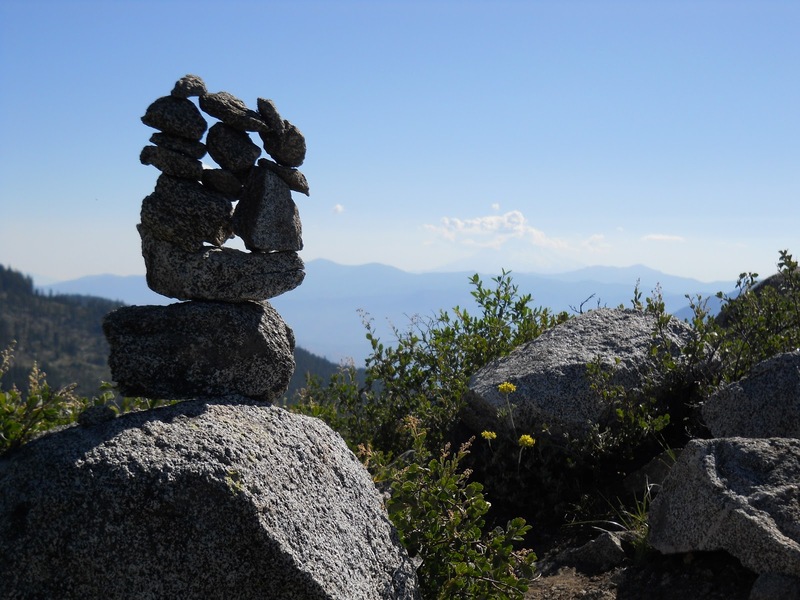 Some of the cairns along the trail are remarkably intricate! 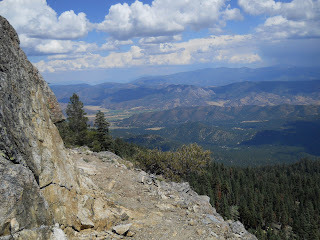 August 2: I started the day early, hoping to finish nearly 25 miles of hiking by 5:00. I had told Amanda I'd try to be at Etna Summit by then, and I didn't want to disappoint her by being late! If I could get there earlier, even better. Nearly an hour into my hike, I saw a hiker camped on the side of the trail. 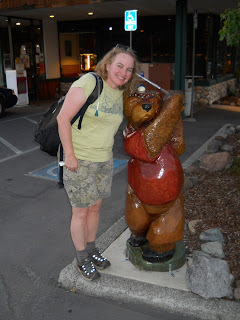 From a distance, I couldn't tell who it was and planned to hike through without stopping, until I found a note on the trail saying, "Say hi to Charmin!" with an arrow pointing down to the camp. I was still inclined to hike by without stopping, but it seemed rude to do so--our friendship might have been strained, but we were still friends. So I stopped to say hi. Charmin seemed happy to see me, but at the time, I think she would have been happy to see anyone. I think she was severely lonely hiking by herself. So much so, she'd even drop notes on the trail asking whatever passing stranger to stop and say hi. We talked for a few minutes catching up on nothing of importance, and I told her about my rush to get to Etna Summit by 5:00. She said her shins were hurting so she wasn't moving particularly fast, but that she didn't think she had shin splits anymore. It didn't hurt bad enough to be shin splints, she decided. In another era, I might have slowed down to hike with her a bit, but not now--not today--so I waved farewell and continued on alone. The Russian Wilderness had more spectacular views. The trail wound its way through more spectacular scenery--it seemed stunning to me that I could grow up in California and have no idea how amazing this part of the state was. How have I missed it all these years? The trail left the Trinity Alps Wilderness, eventually heading into the Russian Wilderness--a name I particularly liked--with visions of spies wearing fur coats and watching me while they downed a bottle of vodka. That's what Russians do, right? My iPod had finally run out of juice the day before, so I had to entertain myself by humming Mr. Blue Sky and Walking on Sunshine, and the James Bond theme. They all seemed perfect for the day. Near the end of the day, I crossed paths with two southbound hikers that looked vaguely familiar. Then I remembered them--Sandals and Sheep Dog. I met them twice before, very briefly. The first time was in Agua Dulce at the Saufleys, and the second time was just beyond Walker Pass. They told me that they wanted to avoid the snows in the High Sierras and planned to jump ahead to Cascade Locks and start hiking southbound as soon as they reached Kennedy Meadows. I expected to pass them long before now, however, and assumed they either got off the trail completely or that we passed each other in a trail town without knowing it. But here they were. Turns out, they actually started a little further north than they told me earlier. They started from Trout Lake, a good hundred miles over the border in Washington, and already hiked the entire Oregon section. The snow, they declared, had been terrible. Especially around Mount Hood. They also told me that, so far, they'd only passed about 20 thru-hikers ahead of me. "You are definitely closer to the front of the pack than the end of it," they told me. I always had some sense of where I was among the pack of thru-hikers, but it was always more of a gut feeling. Early on in the hike, I felt like I was near the back of the pack. By the time I reached Lake Tahoe, I felt like I was in the middle of the pack. Now that hikers seemed to be less common and more and more hikers stopped in various trail towns for a day of rest while I pushed on, I suspected I was closer to the front of the pack. But I never knew how close to the front of the pack, nor how many hikers were ahead of me. For the first time, I had a rough estimate. I was probably in the front 10% of thru-hikers. 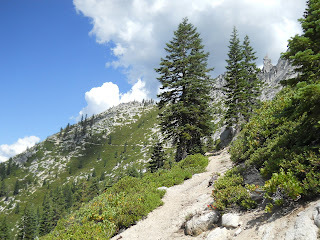 The trail was often times visible for miles in the distance! I arrived at Etna Summit at about 4:00, a full hour early, and Amanda wasn't there yet. I didn't really expect her to be, but I hoped she would be. I spent the next half hour chatting with a fellow sitting in his car, waiting to pick up a couple of friends who were slackpacking the PCT. Or at least as much of it as they could. They were from the Seattle area and had already slackpacked all of Washington and Oregon over the last several years, and were now working their way down into California. He asked about snakes on the trail, and I told him they weren't a big deal. I'd only seen about 30 of them the whole distance, and the vast majority of them were in the deserts south of the Sierras. He was stunned--stunned!--by the huge number. It turns out that him and his friends he was waiting for were petrified of snakes after the fellow I talked with had been bitten by one years before. He showed me a long scar on his leg--a long, ugly scar that resembled a snake--that he said was the result of a snake bite. Woah! I had no idea a snake bite could leave a scar like that! Turns out, that's not why he had the scar. One of his hiking buddies though it would be a good idea to cut a nick by the snake bite to help the venom bleed out and ended up hitting an artery or something--a classic case of the cure being worse than the disease. Eventually he got medical attention before he bleed to death, but ever since, he'd had a particularly strong fear of snakes. Me? "I think I'd be more afraid of well-intentioned friends trying to save me from a snake bite," I told him, "rather than the snake bite itself!" His two buddies arrived, and they offered to give me a ride into Etna about 15 miles down the road. I wanted to accept the offer, but I was afraid I'd miss Amanda driving up the road as I was going down it and without a cell phone signal to call her at the summit, I didn't want to risk it. I found a little patch of shade by the road and sat down to await Amanda's arrival. did see some in the distance behind me. Charmin arrived at 5:00 on the nose and sat down nearby where we chatted some more. She seemed pleased with herself to have made it this far on her aching legs so quickly. I didn't have the heart to tell her that I'd already been there for an hour, and that was after I took a 45 minute break for lunch when I realized I was hiking too quickly. About ten minutes later, Amanda arrived. She offered a cold soda from the cooler, and we took Charmin's trash. Charmin didn't intend to resupply in Etna, we we waved goodbye and Amanda and I went back down into town. I didn't know it at the time, but it would be the last time I'd see Charmin. Our paths would never cross again along the rest of the trail. 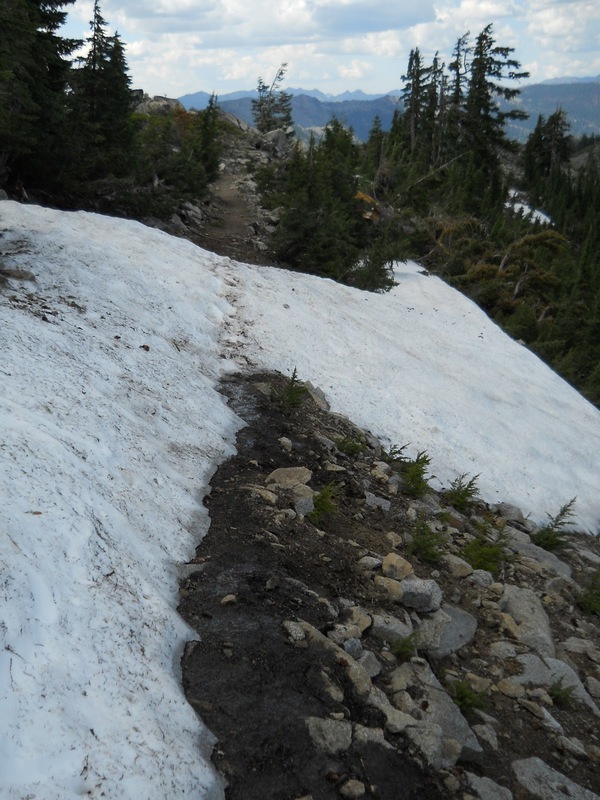 snow on the trail!? GIVE ME A BREAK!!!! Thats sad about not seeing or talking to Charmin again for the rest of the hike. Did you hear if she made it all the way to the end? Who votes for longer segments? I can't handle the suspense! Wow Ryan, with all that spectacular scenery, it is amazing that you manage to hike onward. 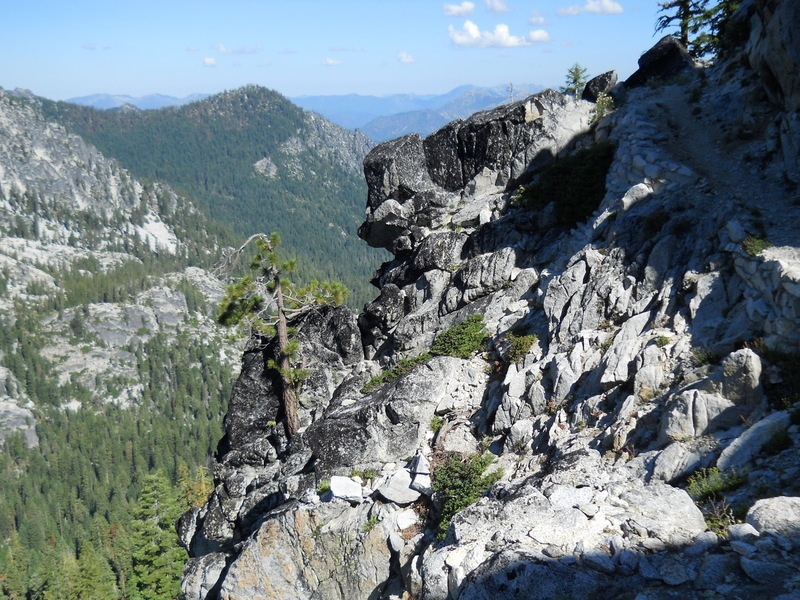 I would be stuck in the Russian Wilderness rock climbing and daydreaming about all the hiking along those rocky crags. Beautiful pictures, thanks for sharing! Well, the vodka is accurate...though I'd be in a faux fur hat and pajama pants instead. And she made excellent time considering the last time you had seen her she still had her tent set up and was suffering from sore shins. Just imagine how far she would have gone past you if she had already packed up her gear and her legs weren't sore!